For many people, it can be difficult to eat a completely balanced diet – busy schedules, restaurant meals and sugary treats can all get in the way when you’re trying to get all of your recommended daily allowances (RDAs). However, ignoring the vitamin and minerals required by your body can lead to trouble not only with your waistline, but with your hairline too. Malnutrition can lead to a range of hair loss conditions and related problems, from brittle and weak strands to thinning hair and receding hairlines. Load up on foods rich in Vitamin C and E. Both help promote good circulation throughout all areas of the body, including the scalp. Vitamin C in particular is used in the synthesis of collagen and the uptake of iron, both of which are vital for a healthy circulatory system. These vitamins are especially effective when consumed together, and are useful when taken alongside medication for preventing baldness. Make sure you are eating enough protein. 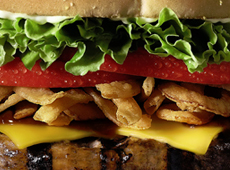 Hair is primarily composed of the protein keratin, so a lack of protein in the diet can cause hair loss. Meat eaters and ovo-lacto vegetarians will get all the protein they need from animal products, while vegans will need to consume pulses and certain amino acid-rich grains. 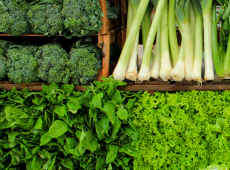 Boost your intake of Vitamin A and Beta-carotene. These elements are found in a wide-range of fruit and vegetables and help to promote healthy cell growth. Consume plenty of B-Vitamin sources. Vitamins B5 (pyridoxine), B6 (biotin), and B7 (pantothenic acid) are especially important, as they are all thought to specifically benefit the hair. Try to get the correct amounts of Copper and Zinc – in trace amounts they can increase the thickness and intensity of colour in your hair. Too much copper, however, is toxic, so check your RDAs and make sure you’re ingesting a healthy amount. Avoid iron deficiency – it is a very common cause of hair loss, particularly in pre-menopausal women. If iron levels to dip to unhealthy levels, this reduces the amount of oxygen available for hair follicles, so whether you’re a man or a woman, it’s important to keep your iron levels high by eating plenty of lean red meat and leafy-green vegetables. 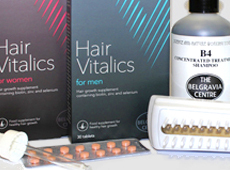 If you’re overwhelmed by this myriad of different nutrients, never fear – The Belgravia Centre’s Hair Vitalics have been exclusively developed by our team of hair growth experts to contain a range of the key vitamins, minerals, amino acids and botanical extracts needed for strong locks and healthy hair growth. 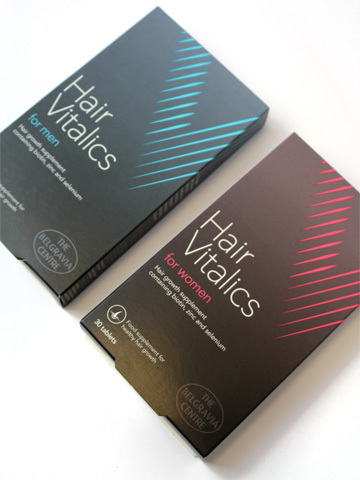 Taking these one-a-day food supplements – available in Hair Vitalics for Men and Hair Vitalics for Women formulations to provide targeted support – as part of a bespoke hair loss treatment plan is therefore a quick and easy way to make sure your body has all the nutrients it needs for a healthy head of hair! "Can You Give Me A Diet Plan to Stop Hair Loss?"